A long time ago, an old man lived with his grandson, Zukif. Zukif’s parents had passed away when zukif was very young. Zukif’s grandfather loved him dearly. However, as Zukif grew older, he began to fall into bad company. He ran away from home. Zukif;s grandfather was heartbroken. He been optimistic for his only grandson and wanted him to study hard. Every evening, Zukif’s grandfather would prepare Zukif’s favorite food, he would sit by the window of their at tap hut, waiting for Zukif’s to return. His health began to suffer and he grew weaker and weaker. The next day Zukif woke up at dawn to collect fresh water from the well in the village. Carrying the heavy bucket, he would walk back to the at tap hut and boil the herbal medicine for his grandfather. This was his routine for several weeks. Slowly, zukif’s grandfather began to get better. He was touched to see how much his grandson loved him. He told Zukif that he no longer needed the medicine, for he knew that his grandson had to collect clean water three times a day to prepare it. “No Datuk! The doctor said that I must give you the medicine three times a day for three years!” Three years went by, and Zukif did not leave his grandfather’s side for even a day. 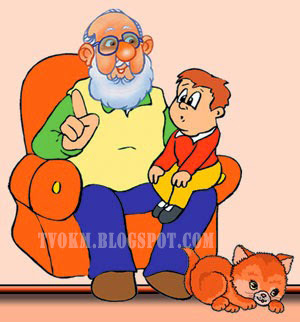 He was pleased that his grandfather was healthy and strong again. Zukif had also gone back to school.